Dexamethasone Ophthalmic Solution is a prescription medication used by veterinarians for treating inflammatory conditions of the eye in dogs and cats. This corticosteroid also aids in the treatment of inflammation, burning, and redness of the ear. Dexamethasone Ophthalmic Solution is often given in combination with an antibiotic, like Tobramycin, to treat inflammatory eye conditions in your pet, or alone for controlling excessive fluid in the brain. Your vet will set the dosage depending upon the condition and its severity, but it is normally given 4-6 times a day by dropping into the eye or ear. Be careful not to touch the affected area with the dropper, the bottle, or your hands to avoid cross contamination. Side effects when using dexamethasone ophthalmic may include stinging of the eyes when the medication is applied. Using the sterile ophthalmic ointment causes blurred vision for a few minutes. 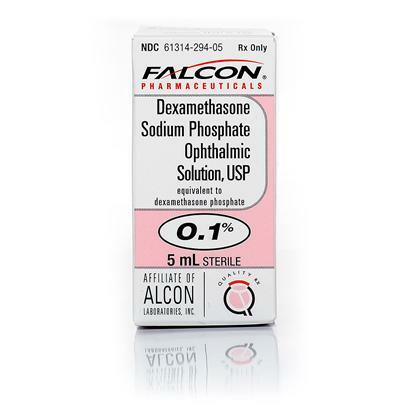 Dexamethasone should not be used in animals allergic to it. Do not allow the tip of the bottle or tube to touch the pet’s eye or owner’s hand as this will contaminate the medication. Use with caution in animals with glaucoma, ophthalmic infections, and corneal abrasions. Do not use in the presence of infections caused by herpes virus. Sodium Citrate, Sodium Borate, Creatine, Polysorbate 80, Edetate Disodium Dihydrate, Purified Water. Hydrochloric Acid may be added to adjust pH. Do not touch the dropper opening to any surface, including eyes and hands. The dropper opening is sterile. If it becomes contaminated, it could cause an infection of the eye.